It's Different for Girls – Review. Hull New Theatre, October 2018. You couldn’t throw a rock without hitting a beat group in the early 1960s, but Hull’s Martha and the Girlfriends were unusual for the era in being one of the first all-female bands that also, like their boy counterparts, chose to play their own instruments. 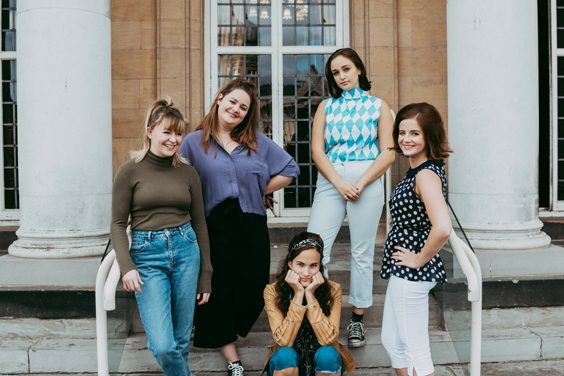 In this way, they were pioneers in the field so it’s only fitting that they should provide inspiration for It’s Different for Girls, a new musical from all-female theatre collective She Productions. The play follows the similarly named five-piece Sindy and the Girlfriends (Betsy, Mitzi, Poppet and Vicki) – Hull-born hairdressers, cleaners and chip-shop servers by day; lively 1960s beat combo by night – as they embark an eventful trip to entertain US troops stationed in Germany. Inevitably, some disturbing life lessons are learnt when their largely male audiences prove to be interested in more than just dancing. 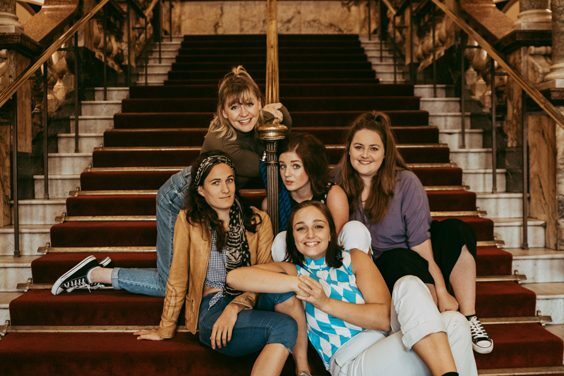 As a jukebox musical, It’s Different for Girls mixes classic songs by the likes of The Ronettes and Frankie Valli with a handful of original numbers which move the story along – and are just as catchy, faithfully capturing the spirit of the period. The tongue-in-cheek choreography is also a lot of fun, particularly during a performance of Sandy Shaw’s ‘Puppet on a String’. Like their inspirations, the cast all play their own instruments. Despite being very much a minimalist production – five actors, barely any set – it is ingeniously staged. Using only varied lighting, judicious sound effects and, at one point, the skeletal outline of a van, an authentic world of rehearsal rooms, grubby barracks and seedy clubs is brilliantly and convincingly realised. The stars also take on the roles of a handful of supporting characters. They use only one or two props to illustrate a change of persona, and at first this is a little disconcerting. It took me a moment, in one early scene, to realise that by donning a jacket keyboard player Vicki (Marina Papadopolous) had transformed into the band’s roadie Keith. Another unusual touch involves them taking it in turns to play the same role. At first it’s a surprise for Keith to return now played by bassist Mitzi (Josie Morley) but by the end it seems perfectly natural that the band’s manager Mrs Smith, evoked using red sunglasses and a leopardskin shawl, can take the form of any of the remaining band members. While the entire cast deliver excellent performances, Alisa Hutchinson steals most of her scenes as the impetuous, dirty-minded chip-shop girl-turned-drummer Betsy. Annie Kirkman, a founding member of She Productions, does most of the emotional heavy lifting as the group’s troubled lead singer, particularly in the play’s closing moments. Although technically it’s a very accomplished piece of work, plot-wise It’s Different for Girls is a bit of a mess, with abrupt shifts in tone that derail a generally light-hearted atmosphere. The play doesn’t seem sure if it wants to celebrate the iconography of the Sixties or juxtapose it with some of the harsher realities of that era, and by settling on neither option ends up exploring some very sensitive areas in an incongruously flippant manner. In particular, a horrific act of violence, while powerfully staged, comes too late in the play to be properly addressed or resolved. As such It’s Different for Girls is left to conclude on an ambiguous note that might not be entirely deliberate. A penultimate musical number with very blunt lyrics, although delivered with complete earnestness, sits uneasily amongst the generally low-stakes froth of the preceding 90 minutes. A brief final coda brings with it a return to gags about pattie butties and a final, upbeat, rock ‘n’ roll song, but that abrupt shift into very dark material only a few minutes previously lingers. As Sindy and the Girlfriends belt out the play’s title track the audience all claps along, but it doesn’t seem so much fun anymore.